Last Updated Apr 2019 – Having a toaster oven is one of those optional choices in the kitchen – you can get by without it. But having a ‘good’ toaster oven is another thing all together. There are loads of different toaster ovens available on the market but the one that really stands out for us is the Breville Smart Oven BOV800XL. 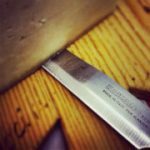 Lets have a look at why we think it is worthy of a place in the kitchen. The Breville Smart Oven BOV800xl is a cross between your regular toaster and the large conventional ovens or cooking ranges ovens. It is a compact oven that offers great functionality, and can do almost every job that you can expect from any heavy duty oven. It can handle everything from reheating, to baking, broiling, and toasting with great efficiency. 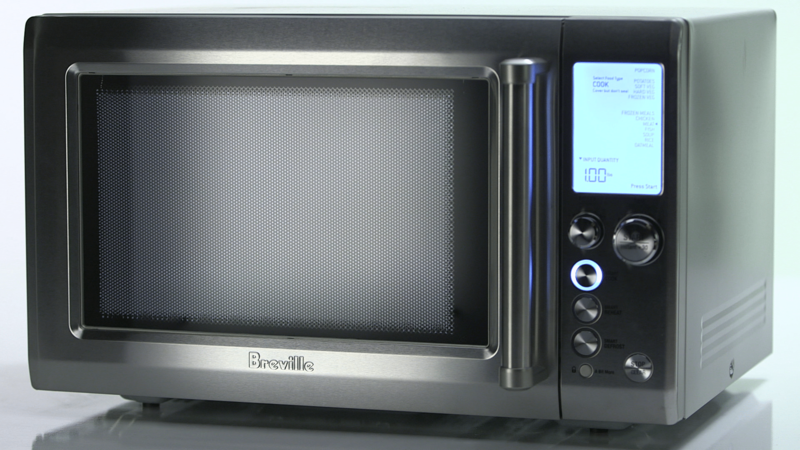 The Breville Smart Oven BOV800XL is a convection toaster oven that boasts great functionality and efficiency. It has loads of advanced features and the technology behind it makes any other toaster oven look like a cardboard box wrapped in tin foil. This stainless steel built oven comes with Element IQ cooking technology (that’s what makes it a “smart” oven) that allows a greater control over the oven temperatures. This Breville smart oven is designed around the principle that every food requires a different amount of heat, and that heat needs to come from different directions. While you would like your cookies to get an even heat from all directions, you would want something like cheese on toast or a pizza to get more heat from the top. Such different methods of cooking can be easily achieved in Breville smart oven bov800xl, as it effectively adjusts the heat distribution and cooks more efficiently. 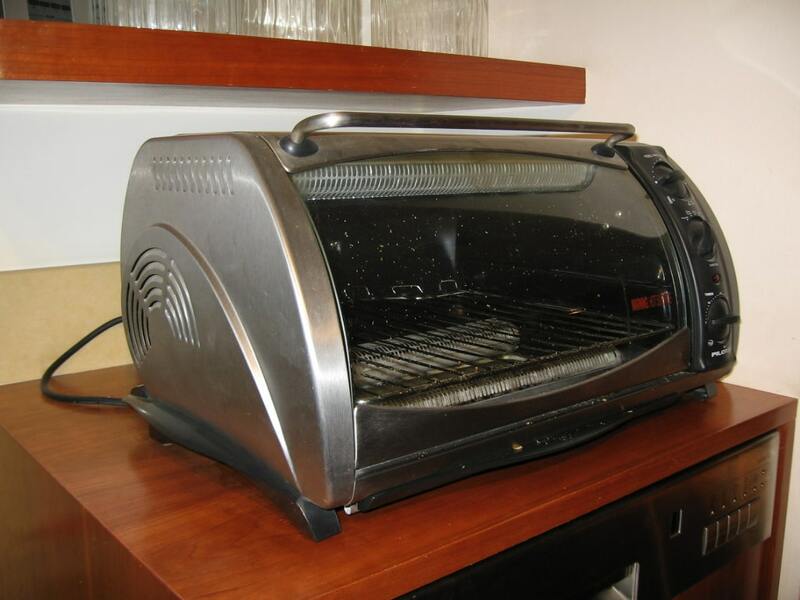 Its large size allows you to toast 6 slices of bread in one go. Even a 13” pizza can easily fit into this roomy oven. It comes with 9 preset functions, which take all the guesswork out of your cooking. It is an extremely user friendly piece of equipment, which is easy to operate, energy efficient, has all your cooking needs covered, and takes care of all safety aspects. We already said that the Breville Smart Oven BOV800XL is an amazing product, offering great value for money. It is a great investment for small families who want a simple and sturdy oven, which is easy to operate and can take care of all their daily cooking needs. But what features of this product makes it stand out of the league? Quite a few of them, here is a roundup of some of the great features of this product. Durable but still looks good. It has a stainless steel frame, which gives it great strength and a clean, elegant look. It measures 8.5 x16.25 x11.25 inches, which means it can fit into a small kitchen with ease, without occupying too much of counter space. This pleasant looking oven will look good in any kitchen. One thing that every home maker would love about this product is that it is extremely easy to clean. The interior is non-stick and has three rack positions. Another great thing about this oven is that it uses much less energy, and wont heat up your kitchen. It also comes with a pizza pan, baking pan and a broiling pan .. all in the box with the oven. 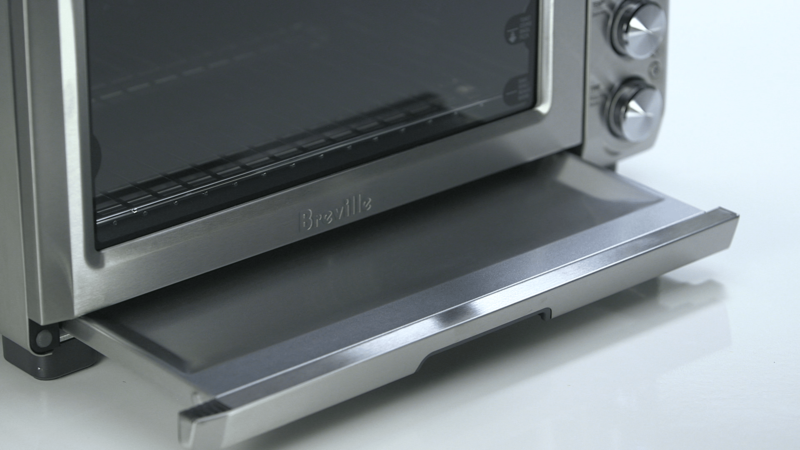 Another simple but highly useful feature of the Breville BOV800XL Smart Oven is the magnetic auto-eject tray. So, you won’t burn your hands while turning the food or taking it out. The LCD display also adds to the user friendliness of this oven; it allows for easy time and temperature setting and monitoring. 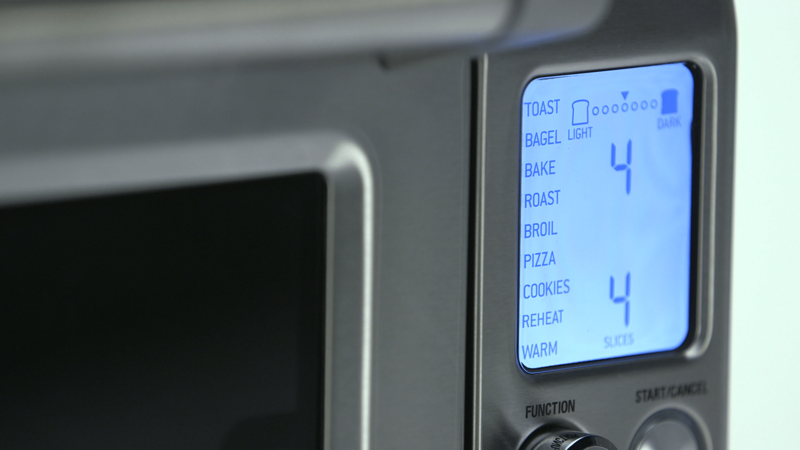 Nine preset functions namely bake, broil, roast, cookies, reheat, pizza, bagel, toast, warm make cooking a breeze. Element IQ technology which we discussed sometime back. To top it up, it has 5 quartz elements, which enable quicker temperature change enabling an unmatched control over the temperature. It has an auto shut off feature, and alerts you once the cycle is complete. Are there some disadvantages that we should be prepared for? There are no major turn offs that you can expect from this oven. However, it is a high power oven, which means you need at least a 15-20 amp breaker on your kitchen plug. If you have a large family, then relying on the breville smart oven as your only oven might not be the best thing to do – you would need to have it as an addition to your regular home oven. Saying that though – this thing can cook a whole pork shoulder – check out the you tube video below. Who should buy the breville smart oven? This smart convection oven toaster is perfect for anyone looking for a compact and versatile oven that can take care of all your cooking needs. It is as suitable for a naïve cook who would depend on the preset functions for setting time and temperature, as much as it is for an experienced cook who wants greater control over the temperature and heat distribution. 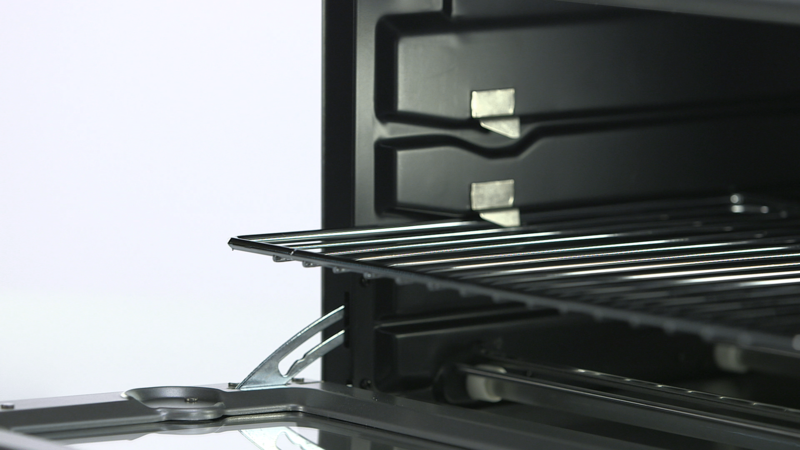 It is especially suited for smaller kitchens, or apartments that cannot accommodate a huge wall fitted oven. 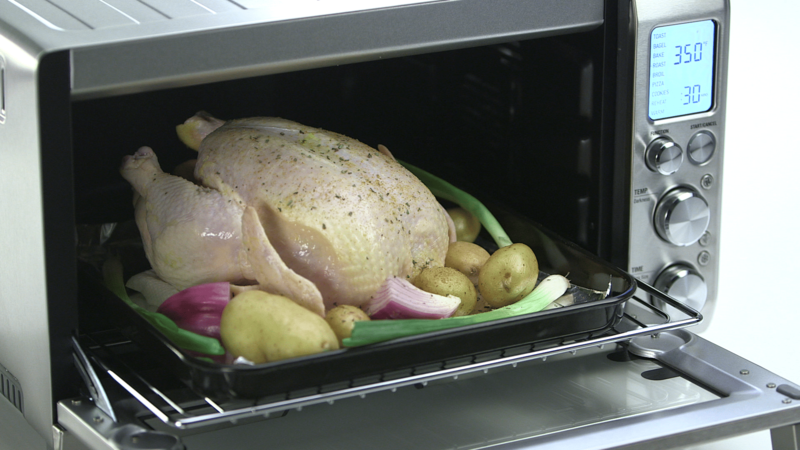 This compact smart oven can sit comfortably on any countertop without taking up too much space. 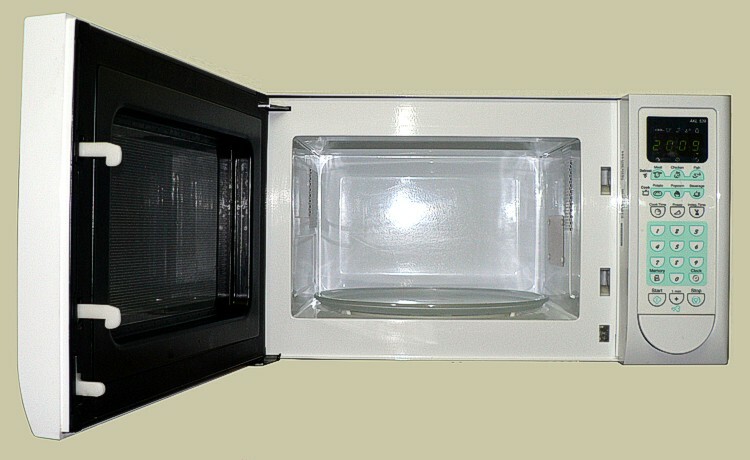 It will take care of all your baking, toasting, roasting, cooking, and reheating needs effectively. It is even good to get the kids interested in cooking with all the preset functions -your kids can have fun making mini pizzas and then watch them while they cook. 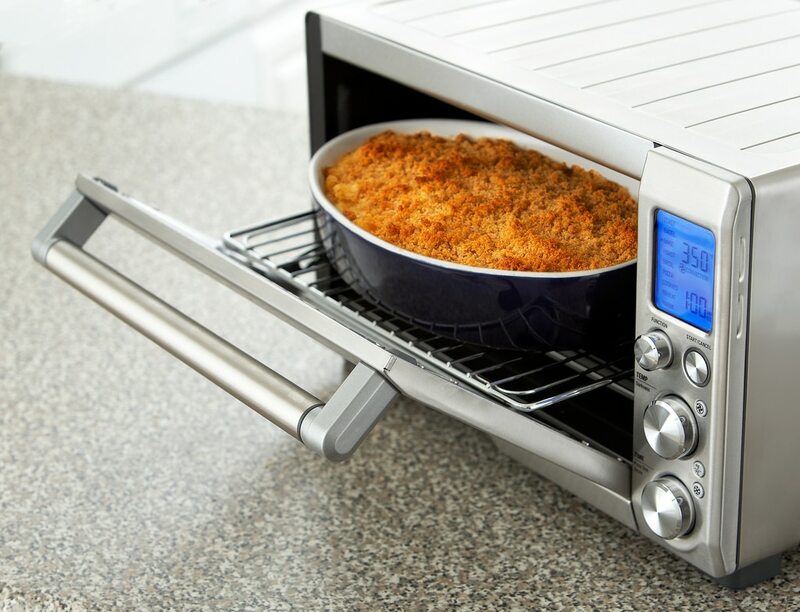 In short, it is an amazing product for singles, couples or small families looking for a compact, durable and versatile oven to take care of their daily cooking needs. All in all, it is a great oven – enough said. It distributes heat amazingly well, allowing you to cook a variety of foods with perfection and utmost ease. The 9 preset functions are an added extra for novices and those who are short on time. It is reasonably priced, and offers great value for money. 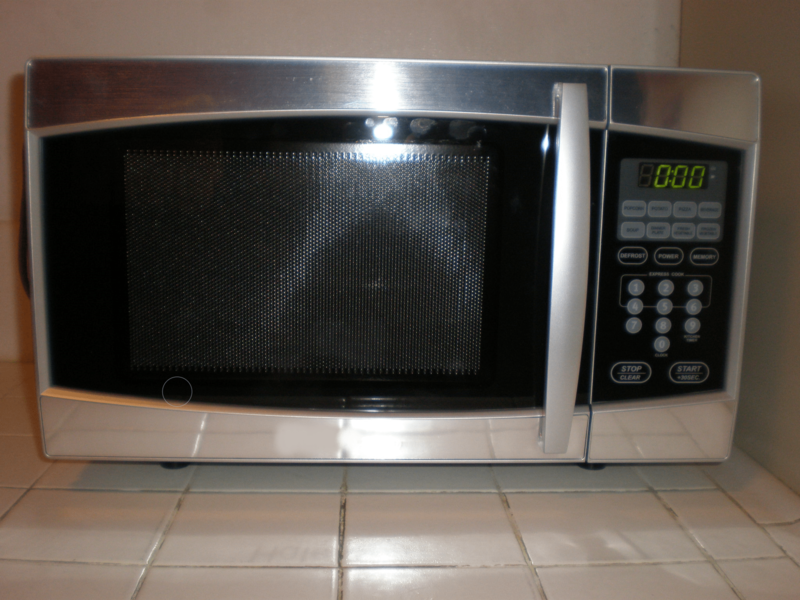 Having a toaster oven is one of those optional choices in the kitchen – you can get by without it. But having a ‘good’ toaster oven is another thing all together. There are loads of different toaster ovens available on the market but the one that really stands out for us is the Breville Smart Oven BOV800XL. The Breville BOV800XL Smart Oven is a convection toaster oven that boasts great functionality and efficiency. It has loads of advanced features and the technology behind it makes any other toaster oven look like a cardboard box wrapped in tin foil.